More and more of the pin-ups have been arriving in our Dropbox folders and emails. 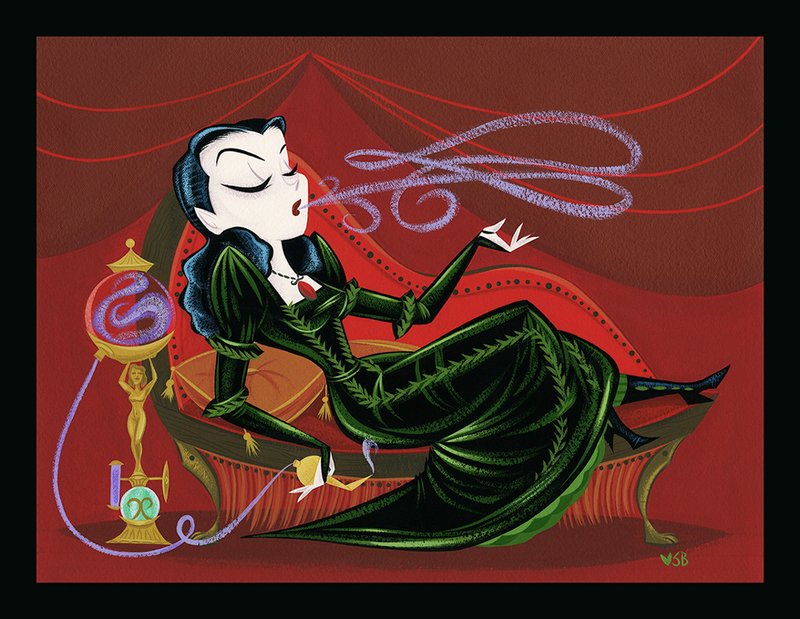 Here's Stephanie Buscema's piece, featuring Kaya, the witch. 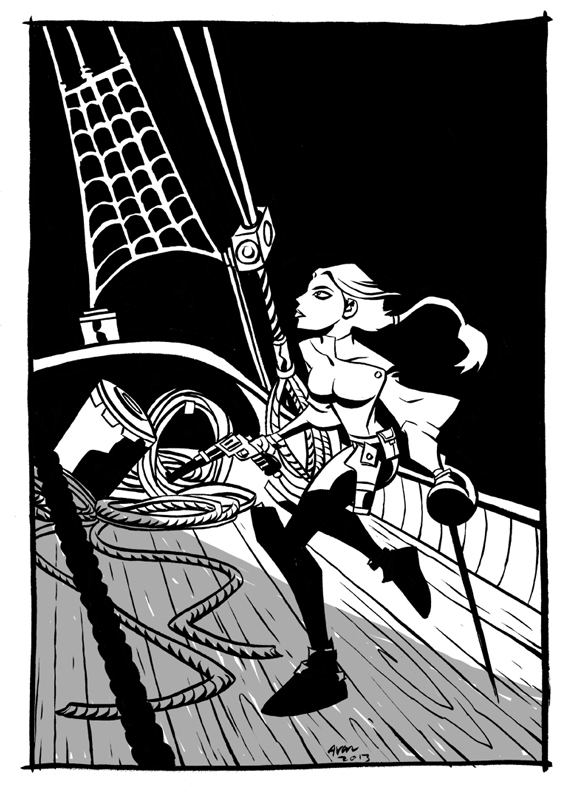 And Michael Avon Oeming's lovely black-and-white of Her Ladyship, ready for action. Michael's piece, similar to Matthew Clark's, is now available as its own backer tier, for $300, and will include The Style to Which She is Accustomed edition, as well as all the digital add-ons. We'll be offering the original art of some of the other pieces over the next few days. Some of you who have followed my career may know that I am an avid gamer, and have been since I was about ten years-old and played my first Dungeons & Dragons adventure. By the time I was in high school, I was a passionate RPGer, saving my allowance to buy game books and minis and supplements and all the like. Of the "all the like" was Dragon Magazine published by TSR, the then-makers of D&D. It was, essentially, their house magazine, filled with articles about gaming, ideas for adventures or adventures themselves, and other various things. In the back, there were comics. And of those comics, there was What's New with Phil and Dixie, written and drawn by Phil Foglio. I loved What's New. It was the first thing I read. It was full of game specific humor and a huge dash of the bawdy, and it always made me laugh. I loved Phil's art, and when he teamed with Robert Asprin to illustrate both the Myth Adventure novels and the comic adaptations of the same, I bought them all. I bought Buck Godot, Zap Gun for Hire. If it had Phil's name on it, I bought it. Phil and his wife Kaja have been making a steampunk adventure webcomic for years, now, called Girl Genius. Right now, they're doing a very bold, short-run Kickstarter to fund the printing of their 12th (!!!) volume of the comic, and to further fund the reprint of the previous volumes in the series. They've made their goal. They've passed their goal. But I love what Phil and Kaja are doing, and if you haven't had the pleasure of discovering it yourself, I really think you will, too. Please consider their campaign, and please consider passing the word about it, as well. We've got a new screen up over at Lady Sabre & The Pirates of the Ineffable Aether today. Our posting has been spotty as heck during the campaign here, I'm afraid, something that will be corrected once we're finished. This has mostly been my fault, as I fell behind on the actual scripts while working on… everything else. Something that will not happen if we do another Kickstarter, I assure you. If you've never actually visited the site, please stop by. Our community there is always growing, and input, feedback, and conversation is not just welcomed, it's encouraged. New update tomorrow (unless we crack 110K today, in which case I'll just have another lie down, then post an update about that!). @Dennis, and I'll add -- at the risk of sounding cranky -- that there are campaigns I myself have contributed to where the rewards STILL have no arrived after three years, with updates coming once every four or five months. We're not anywhere close to where I'd like to be, but in the grand scheme? We're doing better than a lot of others out there. @Dennis, it's interesting that you're posting to this update, rather than, say, any of the recent ones. We are well aware that people are frustrated and disappointed. We have been keeping people apprised of the situation as best we can, but, you'll forgive me, I'm going to point out a couple of things. 1) The books didn't actually arrive until March of this year, so delivery in December of last year was patently impossible. 2) We have had numerous delays for reasons beyond our control, including the death of my father. 3) Delivery was not promised; it was estimated. 4) There are over 10,000 books to be shipped to almost 3,000 people. There are 2 -- I repeat, 2 -- of us handling the fulfillment, and to be honest, really only one, because I have to write for a living as well. This was our first campaign, and it's obvious to me now that we needed a fulfillment service. Hindsight however is 20/20. We never imagined the campaign would be as successful as it was, and we were unprepared for the amount of time or the numbers involved. Over 2000 people have received their books at this point. You'll get yours as soon as we can send it, no sooner. That's all we can do. Your Kickstarter campaign was one of the first I financially supported, and --it seems-- will be one of the last for which I receive my premiums. The campaign ended in June, 2013 and delivery was originally promised in December, 2013. It's now almost December, 2014 and I have not received my book. I have been patient to this point, but am extremely disappointed in your follow-through (or lack thereof). I hope you do not have any intentions to subjecting future backers to one of your ill-conceived plans. This delay is truly inexcusable! Stephanie Buscema and Michael Avon Oeming both give good pin-up, the ineffable aether has a mighty crew, indeed! Hold fast!